Earlier in the year, we took some cues from Marie Kondo by sorting out our homes and removing any items that didn’t spark joy to ensure a fresh start to 2019. Your devices deserve the Marie Kondo treatment too, so now it’s time to move on to our computers, clean out and declutter their contents and make it sparkle! Personally, I use my computer every day but when it comes to tidying up I tend to head for the desk, drawers or keyboard and forget about the contents of my hardworking computer. We’ve put together a list of things that you can do to give your computer a new lease of life both inside and out. While you might find that storing files on your desktop saves you time trying to locate them later, when the desktop starts to fill up it can create chaos. Not only will this lead to wasted time locating specific files but it will also slow down your computer when it starts to creep towards capacity. Those folders on your Windows and MAC are there for you to assign certain types of content – documents, photos and videos – so use them! When it comes to filing your documents away, keep things simple so it’s easy to find them later down the track. For example, if you have a folder for your bills, break down its contents by year and month or type of expense. How many photos in your folder are duplicates? If you don’t know, there’s probably a few there so try sorting and storing them with Google Photos. In addition to your computer, you can also set up your smartphones and tablets to automatically save your photos to Google photos so they’re all in one place. Physical clutter can impact our performance, likewise digital clutter can impact a computer’s performance and speed. Once you’ve tidied up the files it’s time to organise the clutter you can’t see. If you’re not using certain folders or files, move them up to the cloud or onto a hard drive if you want to keep them or if you don’t need them, it’s time to press delete. If you don’t already use a cloud-based backup system, consider setting one up so you have a backup version of your files for safekeeping in the event that your files become corrupted on your device. 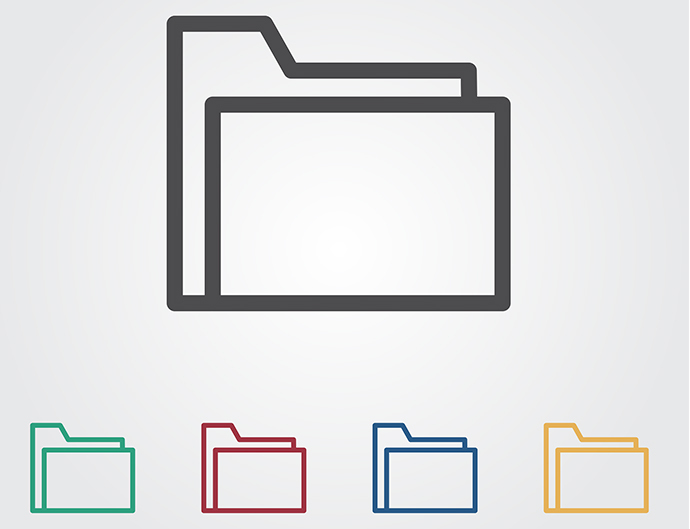 Just like your folder system, make sure you keep these organised too! When we save data and files, the computer finds any available space on the hard drive to store the information. If there isn’t enough space, your computer will fragment or split this data into pieces. When you defrag your hard drive, you are putting these pieces back together and clearing the scattered file clusters. By doing so, you’re likely to experience faster speeds and less loading time. On Windows – Start > Accessories > System Tools > Disc Clean-Up. On MAC – Search for Disk Utility by going to Applications > Utilities > Disk Utility. To spring clean your internet browser, start by clearing out your cookies. Here is a handy guide for clearing cookies on most browsers. A number of temporary internet files are stored on your hard drive to make loading web pages faster. To clear out this data, we want to empty the cache. Use this guide to clear the cache on any browser. Finally, have a sort through your bookmarks and remove any you’re no longer using. Programs can take up a lot of unnecessary space on your computer, especially if you aren’t using them. If there are a number of programs you don’t remember installing or no longer use, free up the hard drive space by uninstalling them. On Windows – Control Panel >Programs and Features. On MAC – Finder > Applications > Uninstall if it gives you the option, otherwise just drag it to the Trash. If you’re still tight on space, macOS users can head to Apple Menu > About This Mac > Storage > Manage > Recommendations and get a few suggestions for cleaning things up. Now that you’ve filled it up, be sure to empty out the recycling bin too! If you’ve built up a lot of clutter in your email inbox, the thought of clearing it out can be overwhelming. First things first, if the content spans over more than one year, let’s clear out everything from the year before (and each year prior to that) into individual folders. Here is a quick tip for filing multiple emails on Gmail and archiving on Outlook. Once you’ve done this, choose a few folders to sort emails into such as work, bills, play, newsletters, etc. Once you’ve done this, you can search using emails, phone numbers, or keywords and file them in bulk in the corresponding folder. Delete, archive or mark as read any emails older than six months old because let’s be honest, if you haven’t actioned them by now, you probably never will. Now that you’ve filed everything away, check through the newsletters you receive and unsubscribe from any emails you haven’t been looking at or don’t care about. Chances are you will remove 95% of these and heavily reduce the spam in your incoming email. Now that you’ve cleaned it out, it’s time to make that computer sparkle! Before doing any of this, make sure your computer is turned off and unplugged. First things first, wipe down the keyboard and mouse or trackpad to remove any bacteria and dirt. A whole lot of dust crumbs can make their way into the inner workings of your keyboard. To get rid of small bits and pieces you may need to shake it around a lot or use an ear bud or compressed air duster if you have one available. While you have the air duster – don’t forget the dust in the USB and HDMI ports as well. Can you see any fingerprints? When cleaning a delicate monitor screen, using everyday cleaning chemicals such as Windex or Spray and Wipe or tap water can cause damage. Instead, opt for a microfiber cloth dampened with distilled water to remove streaks from your screens. Control those chords by tidying them up and bunching them together with cable ties or clamps to ensure a safe area around your workstation. If you have any must do clean ups for your computer each year, share them with us in the comments below. good suggestions there, very useful and informative. We’d strongly beg to differ, Ashley! We’re extremely proud of our team; we’ve had our centre in Cape Town for close to a decade now and they’ve been an integral part of the numerous awards we’ve won over the years. All staff, no matter their location, are trained the same way and can help! If there is any issues that are troubling you, we can always step in to assist so feel free to get in touch via iiOnline@iinet.net.au with your details and we’ll do whatever we can to set things right. Thanks for the advice Brian. I am SO impressed with iiNet tech support…for one thing they actually ANSWER THE PHONE! ALL the staff are well trained, extremely friendly and pleasant, easy to speak to and actually seem to care that your problem is solved or your question answered. I have had many very helpful and friendly calls to the South African iiNet people and couldn’t recommend them highly enough and NO I don’t know anyone who works for iiNet either! We’re extremely proud of our staff – without them, we wouldn’t be where we are now and we wouldn’t have achieved the numerous accolades awarded to us over the years. We believe that we have some of the best, if not the best staff in the industry. We’re delighted that you’re so happy with us! We had iiNet phone support a few weeks ago and the person was excellent- very patient, friendly and positive!!! I have also found the off-shore help of great value, especially when sorting out the NBN links. One of the reasons I have been with iinet so long is that I have never been without a callback and helpful service on a same-day basis. My friends wait days before their problem is addressed! Desk top clutter. I make an alias of a project folder on the desk top and use it for quick access, then trash it when no longer needed. Offshore – brilliant and I’m now best friends with someone in Cape Town and another in Manila. Thanks for the feedback Bill. Glad to hear you have a solution to keep the desktop clutter at bay! I use a programme called CCleaner to clean out junk. It’s available free. Use another called Malwarebytes, also free, to get rid of malware. Thanks for suggesting these programs Brian. Hey, Leo, the info in these posts is going to change the quality of my computer experience. Thank you very much. Thanks for the feedback Carla – wishing you an enjoyable computer experience! Hi, we have been with iiNet for 11.7 years after a tech friends suggestion and have never regretted the decision. Tech support has always been good, friendly NZers in the am and the equally friendly RSA team in the pm. The quality of the service was recently demonstrated by the switch to NBN. The technician arrived when programmed and installation completed in about 1 1/2 hours including full setup and testing. The service has been working at the speed expected and with minimal issues, a huge contrast to friends who heve had no end of problems with other providers. For over twelve years we have depended upon IInet staff members for their friendly, thoughtful and wise advice. Your current report and the web feedback are valuable contributions our confidence. We have been with Westnet/iiNet now for 15 years and always, always, have found their service to be efficient, friendly and fast. Not the cheapest on the block, but at least I can understand the accent of the person with whom I’m speaking. Even though I occasionally check, I haven’t yet found any opposition that can match the service, cost and plan we presently have. I have been a Westnet customer for over 10 years and have never had reason to complain. The help desk staff are marvelous and follow up every call to see all is well. I started with iinet when they were Westnet in around 1995 when we only had dial up (remember that!). Although iinet does not independently transmit in my area and therefore goes through a 3rd party (i.e Telstra) I have stayed with them. The reason? Fantastic customer service no matter where the control room is situated.Not many companies would take the time to try and resolve your issue AND return your calls. “Protected by your IT Service Provider. Since iinet is my IT service provider can you confirm that this notice is from iiNet? We’re very happy to be your Internet Service Provider, but we aren’t an IT service provider, so we’d recommend having a chat to the manufacturer of your laptop.